The competition gap is widening in high-school athletics, but the problem is bigger than high-school sports. The WIAA believes it has found a socioeconomic factor that can help level the playing field. Before every school year, George Foster holds a meeting with all of the coaches at Rainier Beach High School. It’s pretty standard stuff, the Vikings’ athletic director says, with one exception. Rainier Beach is situated in one of Seattle’s least wealthy, most diverse neighborhoods, where census data shows people of color make up three-quarters of the population, compared to one-third citywide. It’s hung five state championship banners in the last decade and bred a dozen professional athletes since the 1980s. You could fill an NBA starting five with its alumni — or at least one heck of a backcourt. It’s also in one of the city’s poorest neighborhoods, where the median income — $34,745, according to the latest census data — is less than half that of the average Seattle household. How is free and reduced-cost lunch eligibility determined? One-child households with an annual income of $15,782 or less qualify for free lunches. For each additional child, the income level to qualify raises by $5,616. To qualify for reduced-cost lunches, a one-child household must make $22,459 or less, increasing by $7,992 for each additional child. But the number the Washington Interscholastic Activities Association, the state’s governing body for high-school athletics, is interested in is 69.8. That’s the percentage of Rainier Beach’s 736 students who qualify for free or reduced-cost lunches, a common proxy measure for poverty. It’s the highest number in the Metro League and 26 points above the state average of 43 percent. Over the past decade, four of every five public schools that won state titles resided below that 43 percent figure. The average for championship teams was 30 percent — 13 points below the state average. Statewide, almost all high-school championships are won by students at wealthier, whiter schools. And the barriers to competition are increasing at ever earlier ages for low-income communities. The WIAA believes it has found a socioeconomic factor that can help level the playing field. Under a new proposal, that 69.8 number would be used as a type of offset against the school’s enrollment. In this case, it would mean a 26-percent reduction in the enrollment figure used to determine whether the school plays at Class 4A, 3A, 2A and so on. For every percentage point more than 10 points above 43 percent stage average, the same is deducted from its enrollment number, potentially making lower-income schools more competitive by allowing them to compete against smaller schools at lower levels. What’s unusual about Rainier Beach isn’t its economic standing, but its athletic achievement despite it. Still, Foster feels the stark inequalities firsthand. When meeting with his coaches, that “anything” they might request can range from new uniforms, more assistant coaches, even fielding an entire freshman baseball team. Stuff many schools — especially those with the athletic prowess of Rainier Beach — receive from their booster clubs, whose budgets in Washington’s most affluent schools can reach seven figures. But Rainier Beach? “To tell you the truth, we really don’t have a booster club,” Foster says. So when Gerald Smiley was hired as baseball coach in 2015, he took it upon himself to start a GoFundMe account to raise $42,000 to revitalize the program. The problem? It was nearly impossible to track how it was spent, and Seattle Public Schools soon banned GoFundMe as a fundraising option. Smiley resigned after one season. Compare that to Glacier Peak, a public high school in the more affluent suburban hills overlooking the Snohomish valley. When budget cuts were going to mean cutting the Grizzlies’ freshman baseball team, baseball coach and one-time athletic director Bob Blair turned to his booster club. They agreed to foot the annual $2,000-3,000 bill. Now, as Blair observes other programs struggle with turnout, he says he hasn’t seen it at his school. Only 9.7 percent of Glacier Peak’s students are eligible for free and reduced-cost lunches, one of 16 public schools in the state under 10 percent. Under the free and reduced-cost lunch proposal as originally drafted, Glacier Peak and other affluent schools would have seen their enrollment number increase by the percentage they are below the state average of free and reduced-cost lunches. Private schools, too. But those rules didn’t make it to the final proposal, which will only look at those above the average. According to data analysis by the Times, private schools have won 25 percent of all state titles over the past decade, while private schools enroll only 7.3 percent all the state’s students. Of the public schools to win championships, four out of five have had fewer kids eligible for free and reduced-cost lunches than the state average of 43 percent. The average champion’s percentage of free and reduced-cost lunches is 13 points below the state average. Who owns the most titles at the state’s top two classifications over the past decade? Mercer Island (26, 2.9%), Bellevue (22, 8%) and Skyline (16, 3.2%). Many of these come in sports other schools aren’t even able to compete in, such as golf, tennis, swimming and diving — country-club sports. Others from sports that require such specialized training or facilities, it’s difficult to keep up without. Before he was the athletic director at Glacier Peak, Blair was O’Dea’s baseball coach, where he won the Class 3A state title in 2005 (and the Fighting Irish have won three more since Blair’s departure). The level of parent involvement he sees at suburban Glacier Peak tops even O’Dea, a private Metro League school located on Seattle’s First Hill. But the Fighting Irish have their own advantages, like a booster-funded project to transform a gymnasium into a suitable indoor baseball practice facility, replete with roll-out turf, pull-out batting cages and a portable pitching mound. Beyond school grounds, many parents turn to private instruction for their children, particularly valuable in what Blair calls “repetition-based” sports such as baseball, softball, golf and tennis — another area where more affluent schools begin to separate themselves. Those sports are where Blair believes the new rule could have its largest impact. “It’s that next level of players,” Blair says, “that ‘B’ group, who would be average without private coaching, but private coaching takes them up a little above average, not quite to the elite level but to above average. No classification system is perfect, Colbrese warns. He should know — in his 23 years leading the WIAA, this would be the fifth time it’s been altered. But this is the first time the state’s governing body has taken a socioeconomic factor into account. If the WIAA’s Representative Assembly votes to approve it Jan. 28, Washington would become the 22nd state to implement a classification modifier in hopes of restoring competitive balance. “We have to be, I think, for a state association to be more intentional,” Colbrese says, in looking at the barriers to participation for low-income communities. Such barriers can begin as early as 6 years old and include participation fees, transportation and the proliferation of club and travel teams, which can be expensive, hypercompetitive and a time commitment not affordable to many. A University of Michigan study found one-fifth of families making less than $60,000 to report a drop in participation cited cost as the reason, compared to one-twentieth of those above that threshold. The Aspen Institute, which every year conducts a national “State of Play” survey with the goal of increasing access to youth sports, reports growing participation overall but a drop among households with incomes below $50,000, particularly precipitous among those making less than $25,000. Only 34 percent of children from those households played at least one team sport in 2017, while 56.5 percent did overall — and 69 percent of kids in households making at least $100,000. By the time kids reach high school, the so-called haves and have-nots are almost predetermined, sifted out by the system one way or another. It’s not the elite athletes who are lost in the shuffle, but rather those who aren’t as naturally gifted, who might turn to the next best thing, something easier or less expensive. It will take more than a new set of rules to reach equilibrium. Colbrese and the WIAA know this, and Farrey has made it his life’s work. Since founding the Aspen Institute’s sports and society program, Farrey has taken his “State of Play” studies to six communities around the country, where his team partners with local organizations to issue a localized version of their annual national report. This year, the Aspen Institute is partnering with the University of Washington, King County Parks and other local organizations to release a King County-specific report, expected to be released in September. Ultimately, the WIAA is only a private, nonprofit governing body for state high-school sports. It’s taken on a societal problem. To really solve anything, they need more money, Colbrese says. While the WIAA searches for solutions at the high-school level, it falls on local communities to open the pipeline from youth sports to high school. From more green spaces in Buffalo and Detroit to delaying soccer travel teams for grade schoolers in Cambridge, Mass., Farrey says his group has found effective solutions in communities around the country. 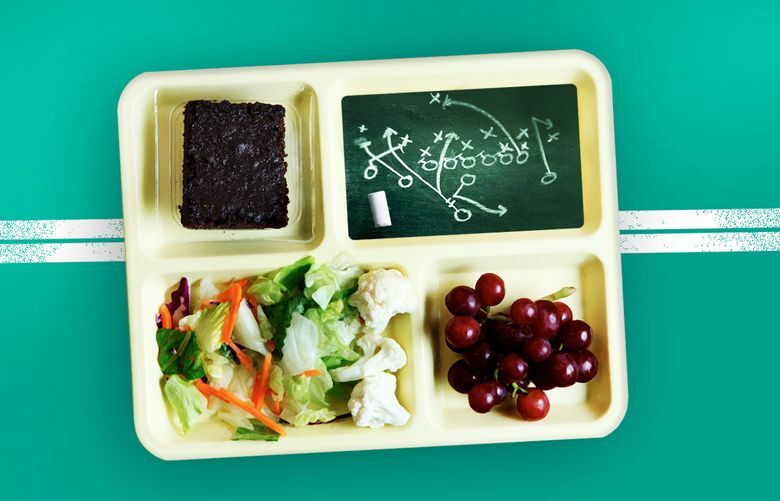 One Washington state representative, Steve Bergquist, is working on legislation that would waive athletic fees for students who qualify for free and reduced-cost lunches. Other states, such as Oregon, have honed in on competitive balance. The Oregon School Activities Association (OSAA), that state’s equivalent of the WIAA, also uses the number of free and reduced-cost lunches, but it looks at on-field performance, too — even moving 30 teams down in football just last year. That’s a no-go in Washington, Colbrese says, where leagues carry more prestige than in other states. And, as the competitive gap widens, more and more states are trying.